Looks to be in very nice condition. This film is noteworthy because of the early, two-color Technicolor sequence at the end of the film. The color looks good. Film is complete and has leaders, titles, end titles and such. An interesting mixed bag of films, many of which are sound. 23 x Mixed 8mm/Super 8 Films. Ranger To The Moon. Hollywood Musical. Werewolf Beast With 5 Fingers/Batman. Review Of '66. For your safety and mine, all film is invisibly security marked. Film looks better projected than represented in the pictures. Clear leader has been attached to head with CIR splice, and film has been cleaned with FilmGuard for future protection. Assorted movie logos tape spliced together by a previous owner onto a full 50ft reel, no box. Cinema International Corporation. The End title from Walt Disney extract. Techno Film (silent). Rank Film Distributors. An interesting mixed bag of films, many of which are sound. Also a 600ft. Triple Echo Trailer. 22 x Mixed 8mm/Super 8 Films. Gathering Of Eagles. Doctor In Distress. House Of Usher. Red River Valley 1, 2, 3, 4. An interesting mixed bag of films, many of which are sound. Mostly 400ft and 200ft reels. 25 x Mixed 8mm/Super 8 Films. Rise & Fall Of Hitlers Germany. Quick On The Trigger. Long John Silver. Gas House Kids 1 - 4. EXPLORE CINEMAShare and discover wherever you are. Here is the Derann 200ft Super 8 colour sound short "This is Scope" with excerpts from Supergirl, Capricorn One, Never Say Never Again, The Neverending Story and The Sound of Music. The picture and stereo sound quality are both very good. MOVIE TRAILER 35mm DARK KNIGHT BATMAN . New. Condition is Like New. Shipped with USPS Media Mail. Reel two contains 1000' and Reel three has 1100' on it. This makes up about an hour. See picture I have shot of the reels. It is like new LPP color. This film is missing reel one. it is Reel #2 & Reel # 3 all the way to the end. Perfect color, unless noted as "warm" in title. Tom's chasing Jerry when he runs, literally, right into the sleeping (and quite nasty) dog later known as Spike. Spike trades off between the two of them, until Tom climbs down the lamp, then finds himself depending on Jerry to help him to the clock. Interesting little curio, a set of 4x16mm BBC countdown leaders. Found in recent house clearance, untested! We have more listed! Bobine SCOPITONE 16mm clip de la chanson Tous les garçons et les filles par Françoise Hardy, filmé par Claude Lelouche 1962. 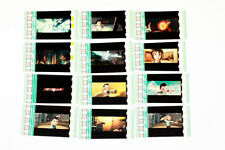 35 mm Film Cell Strip "Love, Chunibyo & Other Delusions! Take on Me"
16mm Film Trailer/Tv Spots "SUPER FLY T.N.T." 1973. Trailer of 20 seconds on plastic reel. It is loose on the reel. I don't have a projector so this is sold as is. Super 8mm color sound CINEMASCOPE trailer1x100'' "AROUND THE WORLD IN 80 DAYS"
Super 8mm color sound CINEMASCOPE. Very nice color. IT MIGHT INTEREST YOU ALSO TO CHECK OUT. Von David Lynch (Drehbuch, Regie), mit Laura Dern, Jeremy Irons, Justin Theroux, Ian Abercrombie, Harry Dean Stanton und Anderen. INLAND EMPIRE. (Inland Empire, Frankreich | Polen | USA 2006). Alter original Kino-Werbevorspann aus dem Jahr 2006 in Normalbild (NB) in der deutschen Kinofassung. Alter originaler Kino-Werbevorspann aus dem Jahr 1993 in Breitwand (NB, flat) in der deutschen Kinofassung. Die Farben sind sehr gut. VIEL LÄRM UM NICHTS. This is a 16mm film trailer for THE BLUES BROTHERS. Very long, considering that it's a trailer. Color looks good. Trailer starts right after leader(photo#2). Title shot(photo#1) appears at the end of the trailer. Alter originaler Kino-WerbevorspannTrailer Nr. 1 aus dem Jahr 1996 in Breitwand (flat) und in der deutschen Kinofassung. Der gebrauchte Trailer zum 8. Enterprise-Kinoabenteuer zeigt erste Eindrücke. Dawn of the Dead 2001 35mm Film Trailer RARE Horror Zombies Romero. Condition is Like New. Shipped with USPS Media Mail. MONSTER FROM UNDER THE SEA version in original box RARE Super 8mm Movie 200"
The condensed version of THE MONSTER FROM UNDER THE SEA is a very rare and hard to get film. 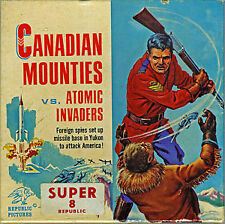 Know now, this is a terrific adventure for the whole family on one reel, 200", running for approximately seven minutes. A true find for a collector and very cheap for something so rare. Please look at the variety of other items I have up for grabs and my feedback to shop with confidence. THE BLACK HOLE version in original box RARE Super 8mm Movie 400"
The condensed version of THE BLACK HOLE is a very rare and hard to get film. Know now, this is a terrific adventure for the whole family on one reel, 400", running for approximately seventeen minutes. A true find for a collector and very cheap for something so rare. Please look at the variety of other items I have up for grabs and my feedback to shop with confidence. Universal 8 400 ft sound edition of the 1941 Universal horror classic starring Lon Chaney Jr and Claude Raines. Screen shots are from the actual film being sold. Much of the opening titles/credits are missing: has only the very end of the opening credits, with Evelyn Ankers and Lon Chaney. This will spice up any film reel! It is complete with no splices, no vinegar, not a dupe, good loud sound, runs great. I ESTIMATE THAT THIS AD IS 30 SECONDS. A fun addition to any reel! Once again this is Reel Two only and is the last 33 minutes of the film. Reel One is missing. It however does include ending cast credits. Whoever wins this item might get lucky and find the other odd reel to complete this feature or maybe you already have the other reel and this will complete the feature for you! Der Verkauf erfolgt unter Ausschluss jeglicher Gewährleistung. Dieser Ausschluss gilt nicht für Ansprüche des Käufers, die auf vorsätzlichem Verhalten des Verkäufers beruhen. Alter originaler Kino-Werbevorspann in Normalbild/Breitwand (flat) und in der deutschen Kinofassung. Just a couple of splices. Beautiful LPP low fade. Of particular interest is seemingly mild-mannered travelling salesman Lars Thorwald (Raymond Burr), who is saddled with a nagging, invalid wife. Trouble is, Jeffries' musings just might happen to be the truth. 16mm Film, " Helmut Schmidt - Ein Portrait des Bundeskanzlers ",31 min. Deutsche Luftangriffe auf Malta u. EL-Alamain. Ca. 5-8 Min. ( 18/24 Sek.). Biete einen 16mm Film aus dem 2. 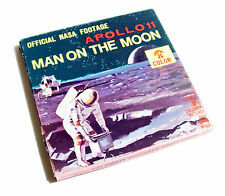 Photos above are not included with this 16mm film, used for promotional purposes only. NEAR MINT: Minimal if any splices or lines or noticeable wear. GOOD COLOR – has a noticeable shift, but still maintains much of it’s color. THE TREASURES OF TUTUMKHAUM in original box RARE Super 8mm Movie 200"
The condensed version of THE TOMB OF TUTANKHNAN is a very rare and hard to get film. Know now, this is a terrific adventure for the whole family on one reel, 200", running for approximately seven minutes. A true find for a collector and very cheap for something so rare. Please look at the variety of other items I have up for grabs and my feedback to shop with confidence.